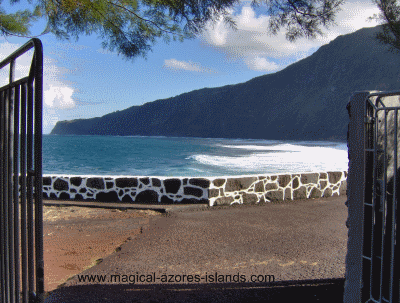 My latest find for accommodation in Azores ... a vacation rental cottage in Faial. Not too long ago, I had the pleasure of spending 3 nights at a comfortable cottage in Praia do Norte, an area on the North West Side of Faial. The location is fantastic for many reasons and the cottage itself is quite comfortable for three of us who stayed there. I highly recommend this cottage. That picture is one of my favourites and it makes me want to go back soon. I stood right there very early one cool morning watching the surf for quite some time while enjoying a warm coffee. It was late November so the waves were a good size and there was a cool breeze blowing salty mist on me. I enjoyed the solitude and imagined all of the different people who would enjoy this cottage. I can picture a variety of purposes for renting this cottage. A young family wanting a summer week at the beach. Honeymooners looking for a comfortable, secluded spot. Professionals looking for a quiet place to rest. Surfers wanting to be close to a good beach. And anyone wanting a self catering vacation in the Azores. Praia do Norte is a quiet, calm and pretty spot on the island. Our cottage was down the hill in a small town called Faja da Praia. As I understand it the population of the area is in the hundreds. So it certainly is a great place to get away from it all. Praia means beach in Portuguese and we were right by the ocean with a very short walk to the beach. Being wintertime in the Azores meant that the temperature was cool (around 60-70 degrees F) and damp. And the waves are larger in the winter. So we did not take advantage of the beach other than to take some pictures and enjoy the view and sound of the waves pounding the coast. There are also quite a few waterfalls nearby. At least one is easily in view from the cottage. With the proximity to the beach, this would be a fantastic spot to stay from May to the end of September. But even in the "off season" it is a great spot to stay. It is secluded, has all the amenities needed, and close enough to all of the major spots of interest on the island. Keep in mind that Faial is small, so you can go around the island quite easily. For example: Horta was only 30-40 minutes away; the airport was 20 minutes away; Capelinhos was 10 minutes away; and Caldeira was about a 20 minute drive. We really didn't use the kitchen in the cottage, but I can say it was a well equipped galley style kitchen (small and narrow) with fridge, stove, microwave, two sinks and so on. We didn't use the kitchen because we were only there for three nights and found that there is a good restaurant (Rumar - at the top of the hill) as well as a pizza place right nearby. So aside from breakfast in the morning, we ate out each day. If we stayed at this accommodation in Azores much longer we would have gladly used the kitchen more. Aside from the secluded location near the beach, there were many good features about this accommodation in Azores that were appealing. After each busy day of exploring Faial, we returned to our accommodation to relax and plan the next day. The dining area and living room (all one room) was quite comfortable and well equipped. The dining table was big enough for everyone to sit at and play cards or other games. Because the weather was damp and cool at night there was a heater for the cottage as well. We found that it did a nice job of keeping us comfortable at night. And surprisingly, the beds (a double and two singles) were quite comfortable. Two of us have the problem of a sore back from time to time but the beds were just fine for us. Oh, I nearly forgot to mention the exterior of the cottage. It is quite private thanks to its location but also thanks to the walls around it (walls are a normal feature around all houses in the Azores). There was an outdoor shower (in addition to an indoor one) that would be very convenient after a day at the beach. and there were hammocks and a barbecue. Perhaps the best feature of the cottage is the rooftop terrace. It is a great spot for sun tanning or enjoying the view of the coast, nearby waterfalls, the beach or the small town up the hill. Want More Information on this accommodation in Azores? Pictured above is the dining area of the cottage. The next picture is on the roof of the cottage, a great place to relax and sunbathe. Want More Information on this Cottage?